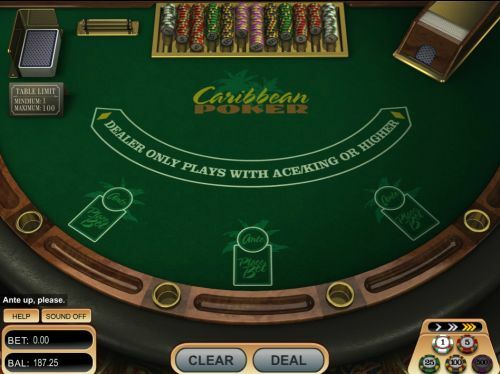 How To Play Caribbean Stud Online - Casino Answers! 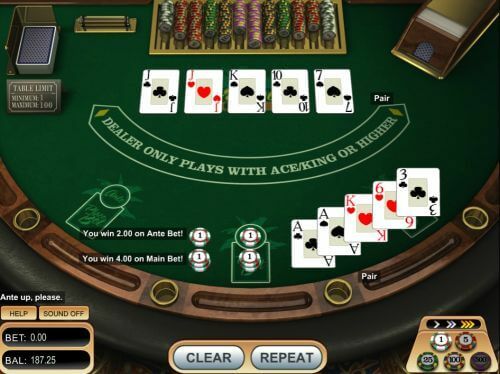 Welcome to our guide on how to play Caribbean Stud online. This guide will assume you aren’t too familiar with Caribbean Stud but it’ll hold short from being a Caribbean Stud for Dummies guide. Instead it will just cover the basics, and show you how to play Caribbean Stud. I will be posting pictures as I play and go through each step. It’s your call on how you want to do it – but I’d recommend opening an account at an online casino to play along. Please note you can play at any casino in practise mode which means no risk of money. If you’re an American I recommend Bovada Casino and for everyone else I recommend VideoSlots.com for playing Caribbean Stud Poker online. Right – let’s get started. I’ll personally be playing at VideoSlots.com as it’s my favourite online casino. As you can see it’s fairly simple. 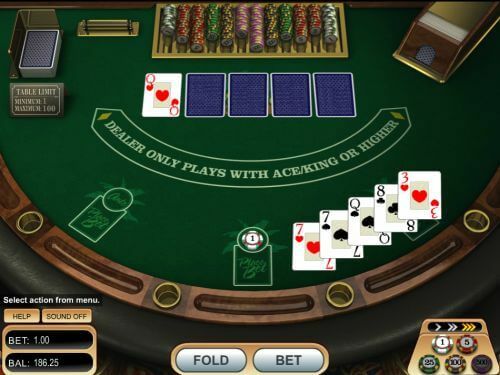 It lists the table limit at the top left which is a minimum of $1 and and a maximum of $100. At the bottom right it shows chips in the amount of $1, $5, $25, $100 and $500. I select that amount to bet. Now you can bet any amount you want. Every casino has slight differences. In this online casino I will click the chip I want ($1) and then click on the Ante spot and it will place a $1 chip there. You can click again to place another chip if you want to bet $2 and so on. If you want to reset your bet to nothing you just hit “Clear” and it removes the chips. It also keeps tab of the bet amount you have in the bottom left so you can keep track. So we have the option of betting or folding and they are the big buttons below. If we choose to fold we are surrendering and we will lose the ante bet we made. However with a pair of 7s we wish to continue so we will click Bet. And that’s how you play Caribbean Stud online. Nice and easy eh? Also you don’t have to place a bet every time you can click “REPEAT” after that hand as a button pops up and it will post the ante I posted initially. Every casino also offers a nice little help menu with the instructions just in case you forget. Where it shows how much you won on the ante bet as well as the main bet. And now it’s your turn. American? Head to Bovada Casino. Everyone else – head to VideoSlots.com. You might just find some special bonus awaiting you there! 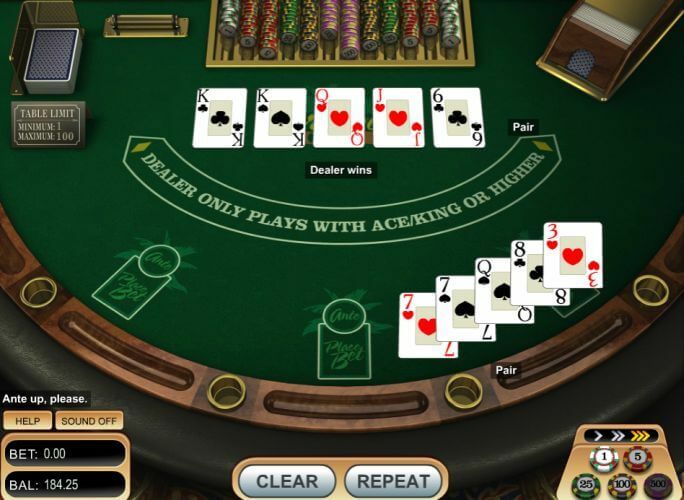 How do you play Caribbean Stud Poker online? How does Caribbean Stud Poker work?